The Jeep Wrangler has entered a new generation, but we have yet to see the first of the many inevitable special editions that will launch. Well, this might be it, according to the folks at JL Wrangler Forums. A member of the forum sent in a photo of a dark silver JL Wrangler on a car hauler. As the forum points out, this Wrangler has a number of special parts that distinguish it from your standard model from the factory, including different rock rails, black tow hooks, black wheels, a gray Jeep logo, and BFGoodrich Mud Terrain KM2 tires, as well as factory steel bumpers. The hood features the Moab decal, hinting this could possibly be a special Moab edition. The forum points out this decal is in the parts catalog for the new Wrangler. Jeep launched a Moab edition of the last-gen JK Wrangler for the 2013 model year. 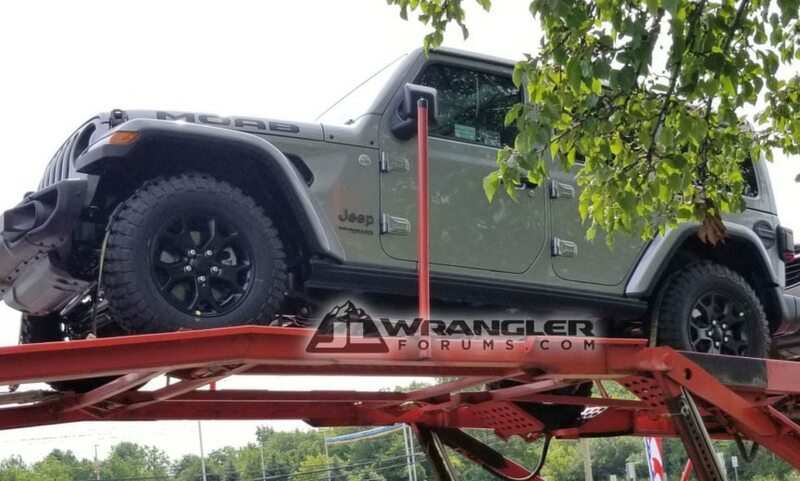 JLWranglerForums said it’s trying to confirm whether this is a special edition Wrangler or something else entirely, such as an aftermarket model. But it’s worth noting that this vehicle was spotted in Auburn Hills, Michigan, near Fiat Chrysler’s headquarters. It was being transported in the area alongside other Wranglers, although all the others were eventually unloaded while the special model remained on the hauler, the forum member said in a post. Although Jeep hasn’t rolled out a special edition yet, the Wrangler already offers quite a bit in terms of variety. There are more than 200 Wrangler products from Mopar, including performance parts and accessories. Jeep will add a diesel Wrangler for the 2019 model year, and a Wrangler pickup is also expected sometime soon.